Findings from the survey of staff in forensic mental health services are the main focus of this chapter. The survey aimed to gather information about how services engaged carers, the types of support provided, how they promoted such support, identified challenges and benefits of this provision, and understandings of differential levels of uptake amongst carers. Chapter 2 begins by describing the forensic mental health services that responded, and then discusses key findings about carer support from the service perspective. Thirty three email contacts were identified across the whole forensic estate, covering high, medium and low secure and community forensic mental health services. Most were in the NHS sector, while two units were privately run. A questionnaire was sent to a named respondent (e.g. Lead Nurse, Senior Charge Nurse, Forensic Practitioner, Community Service Manager) to complete on behalf of each service/unit and a response rate of 79% (26 replies) was achieved. 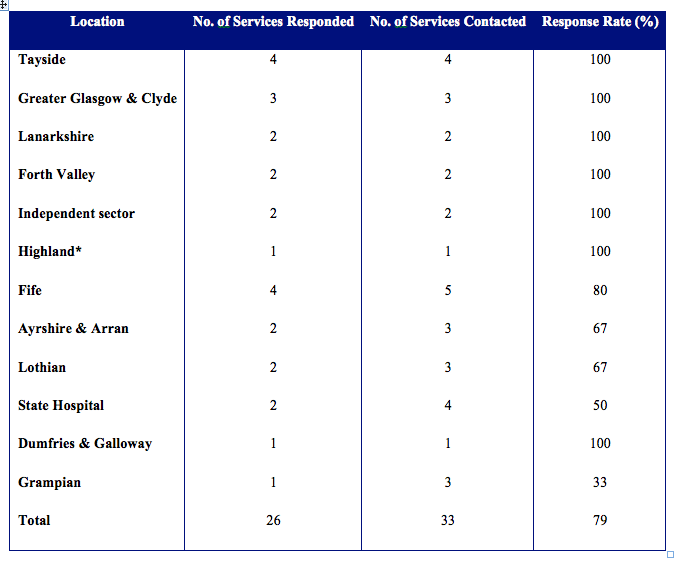 As Table 1 below shows, responses came from across the forensic estate but response rates varied by area, ranging from 33% (Grampian Health Board area) to a 100% response from others. Table 1: Survey response rates by NHS health board. *Both Highland and Dumfries & Galloway responses were completed by one respondent on behalf of the whole forensic mental health service (two respondents in each were contacted originally).